Well-fitted from the thighs and flared from below the knees- this defines a classic sharara pant. If you have just entered the world of sharara suits, you can commence your fashion journey with this. Ideal for which occasion: If you opt for solids then use it for casual wear. However, if you opt for ones with heavy embroidery, motif etc. then wear it for a festive occasion. Though the bottoms are almost like a classic sharara suit, the tops and fabrics are game changers in this category. Preferred fabric: Velvet, Silk, Crepe. Sharara suits are a versatile piece of clothing. Depending on the color, print and fabric you choose, you can stylize this for formal, casual and even festive occasions. Once you know the type of sharara dress you would like to wear, the next step is to decide the colours and print based on the occasion. - For casual occasions: Solids, subtle prints, floral motifs, lace sharara pants. - For festive occasions: Zaris, embroidered, mirrored. - For formal occasions: Solids, triffled prints. To get an idea on what might work best for you, looking for your sharara online is a great idea. 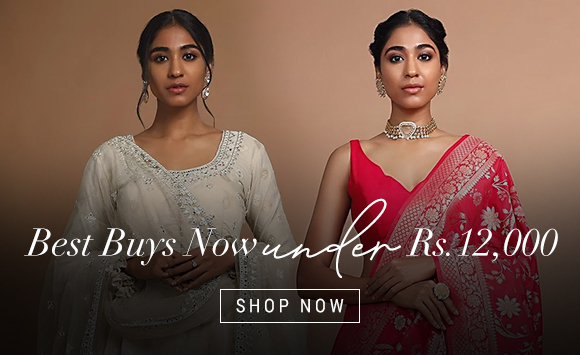 While you browse through sharara dress online on the Kalki portal, you get to explore an exclusive range that covers nearly all types of shararas. If there are discounts available, it’s best that you stock up a few shararas for yourself and have this wonderful option in your wardrobe.